Five traditionally restored townhouses present the beautiful Comfort Inn Kensington Hotel London in the heart of The Royal Borough of Kensington and Chelsea. Modern hospitality standards and traditional charm blend to present the elegance and sophistication of a comfortable, convenient and affordable lodging premise in the centre of London. Comfort Inn Kensington Hotel London is an ideal place to stay whether a traveller is in Kensington for business or leisure. Earls Court and Olympia Exhibition Centres and the Earl's Court Tube Station are only a short walk away from Comfort Inn Kensington Hotel London. Comfort Inn Kensington Hotel London features 125 guest rooms which are equipped with a host of modern amenities such as individually controlled air conditioning, satellite television, direct dial telephone and much more. Home comforts available in the guest rooms of Comfort Inn Kensington Hotel London include coffee makers, hairdryers, iron with ironing board and comfortable furnishing. The Breakfast Room at Comfort Inn Kensington Hotel London provides hotel guests with ample opportunity to enjoy a full continental breakfast. Diners and restaurants located in the surrounding area of Kensington feature excellent dining options for guests and the Kensington Lounge of the hotel is the ideal place to relax and savour some delightful beverages in the evenings. Berkeley Square, Big Ben, British Museum, Buckingham Palace, Earls Court Exhibition Centre, Greenwich Observatory, High Street Kensington, Hyde Park, Kensington Palace, Kew Gardens, Madame Tussaud's and Royal Albert Hall are some of the London area attractions located close to Comfort Inn Kensington Hotel London. Featuring 125 guestrooms appointed with style and comfort, Comfort Inn Kensington Hotel London provides a good lodging option for guests. Nearby restaurants provide excellent dining options for the hotel guests and the Breakfast Room located onsite at Comfort Inn Kensington Hotel London features daily deluxe continental breakfast for a nominal fee. Kensington Lounge features evening cocktails and socialising. London remains one of the world's favourite cities. 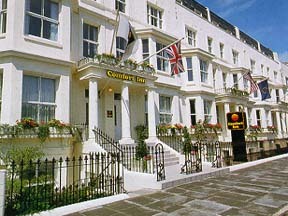 Guests staying at the Comfort Inn Kensington Hotel London are close to the following London attractions.